These pieces were made for a boutique hotel that wanted work centered around the great American inventor Thomas Edison and his lightbulb. They also wanted elements to reference the city the hotel is located in, Louisville, Kentucky. I incorporated materials inspired by the natural and cultural landscape of Louisville as well as materials that reference Edison...horses and the derby, bees and hives, feathers for swans, lightbulb filament and 'Made in USA' insignia. The hotel chose the photographs which I printed and stained with coffee for an aged look. This small piece was made for a friend who wanted something as a gift for her husband for their wedding anniversary. I used a print provided from their wedding day and embellished it with elements that would envoke a feeling of a celebration while incorporating natural elements that would remind them of the Lowcountry where they met. The photograph is nestled inside a gold playing card holder with seeds, paper, dried dill flowers and palmetto spines, trim and paper fruit. These pieces were made for the 2017 Spring issue of Modern Farmer Magazine. I photographed local Charleston farmers on their farms. 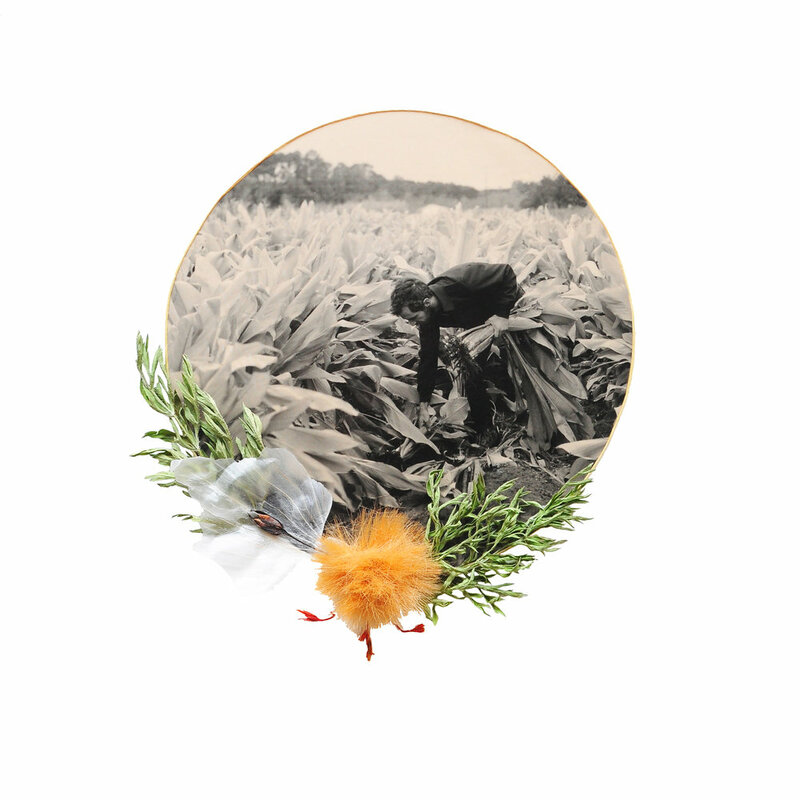 Each piece is about farming and incorporates elements such as seeds, seed packets, grain stocks, American vintage stamps, carrot greens, vintage labels and paper. Have a special photograph that you want made into a piece of art? Book cover pieces can be made in an assortment of sizes and layouts to fit your needs and budget. They can be made in half or whole book layouts, large or small. Each piece comes framed in a black shadowbox, ready to hang. Just choose a layout below. 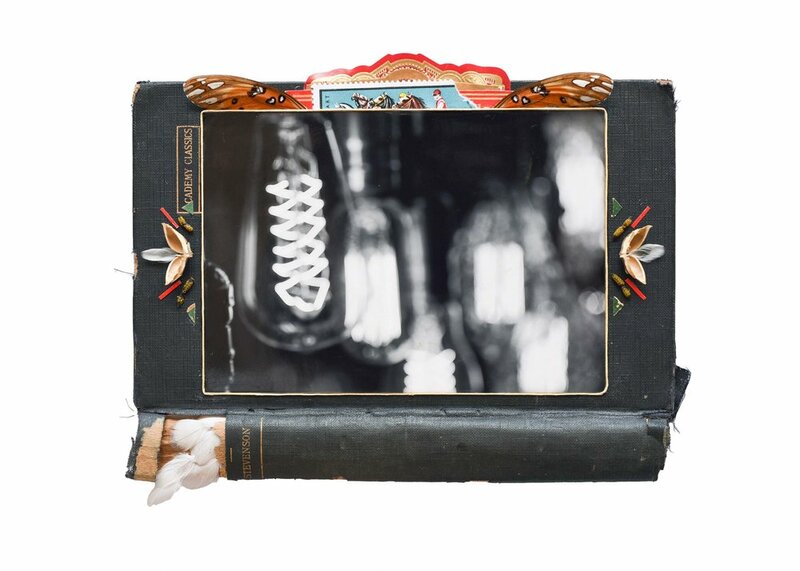 Whole book cover pieces are more embellished and can be made vertically or horizontally with the photograph on one side and found materials on the other. These measure approximately 8.5x11in and come in a 16x24in shadowbox frame. Price ranges from $600-$800. Half book cover pieces can be made either vertically or horizontally with the photograph as the main focal point. They range from 4x6in to 5x7in in size and come in a 11x14in shadowbox frame. Price ranges from $300-$500, depending on the amount of embellishment you desire. Want something different from a book cover? Pieces can be made from all kinds of things like playing card holders, tins, on plates or that special thing I haven't found yet. Or do you want something simple on paper? Maybe a vignette is right for you. See below for ideas. Please contact me for more information or if you're ready to start your commission!